Assessing the structure and function of the hand is the first step in identifying specific hand function and writing skill areas requiring attention. 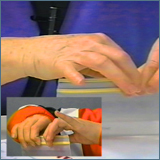 This video demonstrates Mary Benbow's protocol for assessing developmental hand function. Forearm and wrist stabilization, separation of the two sides of the hand, arch and web stabilization, precision translation, and rotation are discussed and demonstrated. 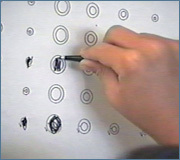 This video demonstrates efficient hand function and contrasts that with problem examples for each item of the assessment.